after adding this registry key you have to reboot the server and then it works. Why exactly that happens I don't know but it happens if an active directory account attends to much active directory groups. since this have to be done on every single machine it should be covered in a company rule which is distributed to every machine then this cause eventually also other problems. Microsoft's ASP.Net team is offering a free AJAX CDN (content delivery network service) to cache AJAX libraries and boost Web site performance, a company official said this week. With the Microsoft AJAX CDN, performance can be significantly improved for ASP.Net Web Forms and ASP.Net MVC applications using ASP.Net AJAX or jQuery libraries, said Scott Guthrie, corporate vice president of the Microsoft Developer Division, in a blog entry. With C:\Windows\Microsoft.NET\Framework\v2.0.50727\aspnet_regsql.exe its possible to create needed asp.net membership tables for authentification in web / win applications. The /debug option causes the compiler to generate debugging information and place it in the output file or files. Specifying +, or just /debug, causes the compiler to generate debugging information and place it in a program database (.pdb file). Specifying -, which is in effect if you do not specify /debug, causes no debug information to be created. Specifies the type of debugging information generated by the compiler. The full argument, which is in effect if you do not specify /debug:pdbonly, enables attaching a debugger to the running program. Specifying pdbonly allows source code debugging when the program is started in the debugger but will only display assembler when the running program is attached to the debugger. Use this option to create debug builds. If /debug, /debug+, or /debug:full is not specified, you will not be able to debug the output file of your program. If you use /debug:full, be aware that there is some impact on the speed and size of JIT optimized code and a small impact on code quality with /debug:full. We recommend /debug:pdbonly or no PDB for generating release code. One difference between /debug:pdbonly and /debug:full is that with /debug:full the compiler emits a DebuggableAttribute, which is used to tell the JIT compiler that debug information is available. Therefore, you will get an error if your code contains the DebuggableAttribute set to false if you use /debug:full. For more information on how to configure the debug performance of an application, see Making an Image Easier to Debug. 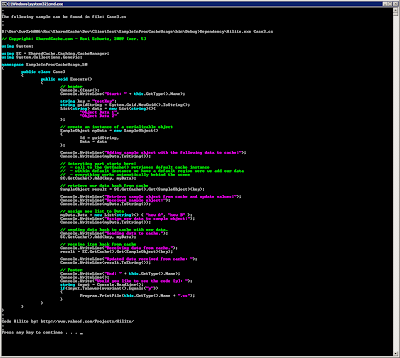 To change the location of the .pdb file, see /pdb (Specify Debug Symbol File) (C# Compiler Options). 1. Open the project's Properties page. 2. Click the Build property page. 4. Modify the Debug Info property. For information on how to set this compiler option programmatically, see DebugSymbols. a cool thing - shared cache ver. 5.0 sample's are "Hilited"
in my test installation of Windows Server 2008 R2 I found today below the "Add Features Wizard" the item: "Branchcache" and I was asking myself if this is based on Velocity CTP 3 or is this an indiviual development?? BranchCache, available on both Windows Server 2008 R2 and Windows 7, enables client computers in a branch office to retrieve content securely and locally, instead of retrieving it from a central office server. Because branch offices are typically connected over slower WAN links, BranchCache reduces WAN traffic, and increases application responsiveness on the client computer. 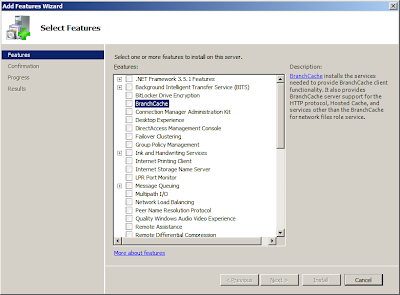 BranchCache installs the services needed to provide BranchCache client functionality. It also provides BranchCache server support for the HTTP protocol, Hostet Cache, and services other then the BranchCache for network files role service. Never save state on a Domain Controller, doing so can cause domain synchronization issues. Never pause a Domain Controller, this can cause replication issues. Do not take Snapshots of Domain Controllers. Use fixed size disks, this will improve performance, and help reduce disk fragmentation. Always defragment a physical disk before creating a virtual hard disk. Be mindful of the intergration services affect on a Domain Controller. If you provide the time synchronization service to a Domain Controller, you can cause time synchronization issues in your domain. Dont expand the Virtual Hard Disk if you have snapshots which haven’t merged with the main VHD. This will make it impossible to remerge them. If you cannot merge your snapshot (avhd) files back into the main VHD. You can attempt to use Winimage (http://www.winimage.com) to retrieve the data from within the snapshot file. To do this simply rename the snapshot file from string.avhd to string.vhd then open with winimage. During the past 2 years I installed TFS 2008 (Team Foundation Server 2008) at least 25 times most of it for testing and migration purposes. Same I had to do now for a migration scenario from two single installations into a multi-layer installation. Since Service Pack 1 is out it's possible to install TFS 2008 on Windows 2008 (x-86) and as we know there is now Windows 20008 R2 out but there are no downloads for x-86. 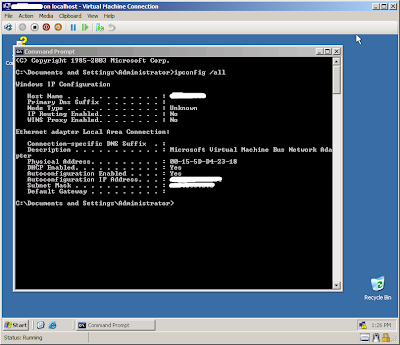 Therefore we have to take an earlier Version: Windows Server 2008. 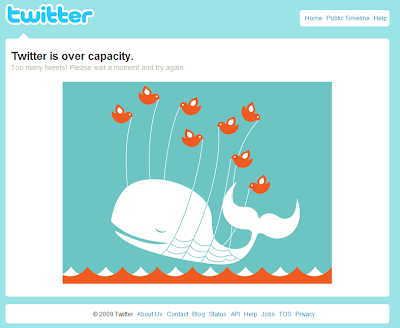 At the end of the day it worked beside the "Reporting Services" - as usual! I will try not to get emotional now but it should not be a problem for Microsoft to create installation files which are as easy to install as previous installations. Press 15 times enter, choose your servers and done - no they prefer to handle thousands of forum messages, emails, sending responses to blog post etc. take 10 % of your communication efforts and put them into a normal installer for single and multi installations with new software. I really hope Micorosoft consider this for the next TFS 2010. Download SP1 from the Microsoft Web site, and save the update to a folder on the local computer. For example, you can save the file to C:\SP1Download. 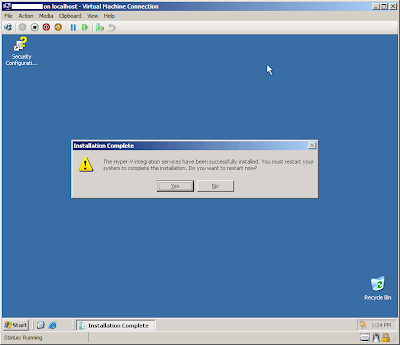 From the files that originated on the DVD for Team Foundation Server, copy the AT folder to a location on the local computer. For example, you can copy the folder to C:\InstallMedia. Create a folder where you can merge files from SP1 and the DVD. You must replace C:\MergeFolder with an absolute path, but you can replace C:\InstallMedia and C:\SP1Extract with absolute or relative paths. From C:\MergeFolder (which you created in step 4), run setup.exe to install Team Foundation Server with SP1. The selected instance of SQL Server is not compatible with Team Foundation Server 2008. A compatible version of SQL Server is not installed. The SQL Server Analysis Services assemblies are installed, but they are the SQL 2005 version instead of SQL 2008. 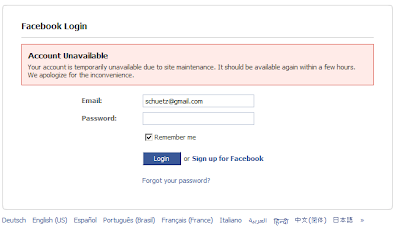 What the hack - why Facebook.com is closing my account for a maintenance window?? ?